The Lesedi La Rona diamond is the third-largest diamond ever found, and the second-largest of gem quality. Discovered in Botswana, the Graff Lesedi La Rona is the largest, highest colour, highest clarity (top D colour) diamond ever graded by the Gemmological Institute of America GIA - and the largest square emerald cut diamond "in history", according to a statement issued by Graff. It was cut from the 1 109 carat Lesedi La Rona rough diamond, which means "Our Light" in Tswana. From discovery to completion the process of analysing, cutting and polishing the Graff Lesedi La Rona took over 18 months. Graff has cut and polished the majority of the 20 largest diamonds discovered this century, the statement said. According to Laurence Graff, who founded Graff in 1960, his love affair with diamonds has been life-long and crafting the Graff Lesedi La Rona is "beyond words". Found at the Lucara Karowe mine in Botswana, the rough diamond was the largest gem quality rough diamond discovered in over 100 years, and the second largest ever found, according to Graff. 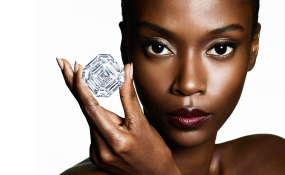 Even with the experience gained from the polishing the 373-carat diamond, the Lesedi La Rona presented a unique challenge to Graff's expert gemmologists. They had never analysed a stone of such a prodigious size, which was too large for their existing equipment. A scanner had to be custom built specifically for the Lesedi La Rona with brand new imaging software capable of probing its vast expanses. There was no room for error. It was impossible to predict how long each stage - the initial cutting with precise lasers, followed by the shaping and faceting by Graff's highly skilled diamond artisans - would take. It took hundreds of hours to polish the table facet - the largest facet at the top of the diamond - alone. Alongside the Graff Lesedi La Rona, a total of 66 "satellite" diamonds have also been polished from the world-famous rough diamond, ranging in size from under a carat to in excess of 26 carats. Pioneering laser technology was used to make the first incisions upon the stone. "Cutting a diamond this size is an art form, the ultimate art of sculpture. It is the riskiest form of art because you can never add and you can never cover up a mistake. You can only take away. You have to be careful and you have to be perfect," says Graff. GIA identified the Lesedi La Rona as part of an elite group of "super deep" diamonds formed three times deeper than most other diamonds. Rare emissaries of geological information, Graff has donated fragments of the Lesedi La Rona to the Smithsonian Institute to help advance diamond research. Laurence Graff overseeing the polishing process at Graff's cutting and polishing facility in Antwerp.